I’m currently reading Ancillary Justice, by Ann Leckie. The book moves at a turtle crawl at this point (200 pages in or thereabouts), but reviewers on Goodreads say it picks up in the second half, which I’m almost to. So I’m hanging in. One of the interesting things Leckie does with this first-person tale is make the narrator gender blind. As such, she (and I’m making an assumption the narrator is female) uses the female pronouns for everyone. It’s an odd narrative trick, and one I’ve not encountered before. I think it works on one level and doesn’t on another; it makes Leckie’s world seem immediately different and alien, but the price is that it distracts from the story a bit. I found myself wondering in the first few chapters where all the men were. Did something happen to them? Do men, in fact, even exist in this universe? Even after the narrator tells us she can’t discern gender, it still seems like there are no men. Even after someone corrects her about a male character’s gender, the distraction remained. Now, 200 pages in, I’m wondering about the gender of each character she encounters. Which is interesting, because I’m not sure I’d have the same reaction if the narrator saw everyone as male. Even knowing the narrator was unreliable, I would probably assume everyone was actually male until told otherwise. The old saw states that you should avoid anything that pulls the reader out of the story, so it’s a bold move on Leckie’s part to use female pronouns as the narrator’s default. And constant distraction aside, I like it. I find myself wondering what it would look like as a movie or TV series, and could see a clever director doing some very cool things with the gender blindness. And I’m curious if women reading the book have the same reaction I’m having. In other words, is my reaction due to my gender or my programming as a reader? There’s probably discussions about this on the internet somewhere, and if I weren’t typing this on an iPad with a tenuous WiFi connection, maybe I’d look before hitting the POST button. Anyway, it’s interesting. 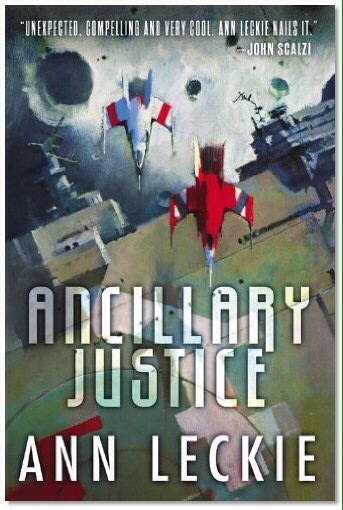 If you haven’t read Ancillary Justice yet, pick it up. I can’t say if I recommend it yet, being at the halfway point, but if you want to see a different way of evoking wonder, it’s worth checking out. You are currently reading Before Coffee: She at Kicking the Pants.